Did You Know We Moved! If you have been by the shop in the last couple of weeks you know it has been a little crazy around here. We had to move from our old location on Santa Rosa Avenue that we had been at for 25 years. It was a big job but we are happy to announce that the hardest days are behind us and we are now open at our new location, 883 Sebastopol RD Santa Rosa CA 95407. Its less than three miles from the old shop. A big thank you to everyone that helped us along the way. We would also like to thank all of our great customers for the support and for your patience throughout these last couple of weeks. Come say hi and check out the new show room! We received our 2019 Hobie demo fleet, which means our 2018’s are now available. So for everyone who calls all year asking when we are gonna sell them, now is the time to scoop them up before they are all gone. 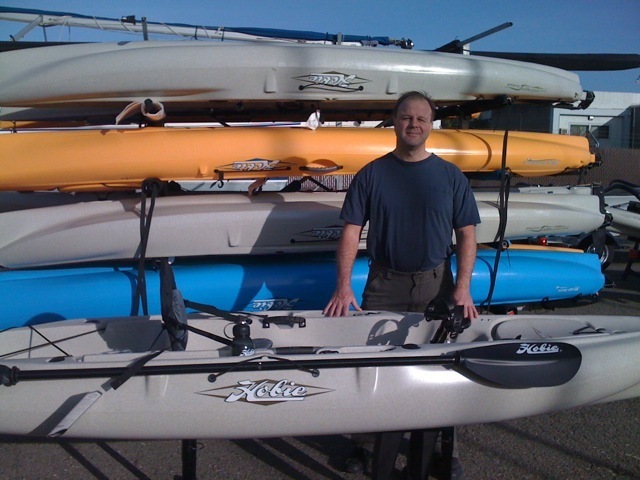 We take the upmost care for our demo kayaks and they are never used as rentals. There is always a trained Hobie professional there when these kayaks are used. Most of them are in like new condition! Swing by the shop and give them a look before they are gone. Feel free to call us (707)-542-7245 for pricing and availability. As always best wishes from the Wind Toys crew and have a Hobie day! The New 2019 Hobie Outback Has Arrived! Come by the Santa Rosa Store to see Hobie’s new 2019 Outback. It sports the new Vantage CTW seat provides extra width for unmatched room and comfort. Four molded-in rod holders, multiple deluxe H-Track mounts, and numerous high-capacity storage compartments ensure that all of your gear is at your fingertips. Powered by the MirageDrive 180 with ARC Cranks + Turbo Fins – now standard on all Outbacks – this fine-tuned angling vessel is highly versatile, fast, quiet, and exceedingly nimble. Now featuring our Kick-Up Rudder system with dual steering capabilities, combating drift and navigating tight water has never been easier. Come see us at the Marin Home & Garden Expo this weekend May 20 & 21 at the Marin Civic Center. The new Hobie Eclipse will be there along with the New Mirage Drive with reverse starring in the Outback, Sport, Revolution and Oasis! Come by and ask questions, try the boats on for size and sign up for demos. Come see us at the Sonoma County Home & Garden Show this weekend, March 17, 18 & 19. See the new Hobie Eclipse - Top Innovation Winner. The new Mirage Drive with reverse will be there in all our boats including the i11 inflatable Mirage SUP, Pro Angler fishing monster, Sport 9 foot kayak, Outback in Camo - new this year! The Hobie Tandem Island Sailing/Kayak trimaran is also on display. Come by and ask questions, sign up for demos and see these awesome boats in person! Mark your Calendars for the 2016 San Francisco Boat Show! Planning is now in full swing for the 2016 Progressive® Insurance San Francisco Boat Show® taking place at Pier 48 & McCovey Cove / AT&T Park. The 2016 show will move to Martin Luther King Day weekend, January 15–18, 2016. We look forward to seeing you there! join us in the hobie booth for our 30th year celebration! For all those who would like to join us, we will be at Doran Beach/Bodega Bay Friday April 18 at 4:30pm near the jetty to be with the rest of our Hobie Family as they celebrate their paddle out in Southern California. Bring your boards or boats and great stories! We'll send our flower leis into the ocean. Wind Toys joins the Alter family in celebrating Hobie Alter's amazing life and the culture he unknowingly created. Thank you Hobie Alter for creating that culture in which we choose to live and guide our own lives and families! Have a Hobie Day! Original artwork from America's Cup Park, San Francisco. This artwork is on fabric stretched on frames and was hung throughout the park during the America's Cup. Please call John at 707-542-7245 for more information. Fleet 281 enjoyed fair winds for their Third Sunday Sail - four boats this time - beautiful day! Join us next month November 17th - likely Tomales Bay again. Call the shop for details and/or join us for our Fleet meeting November 6th! Strictly Sail started a little crazy weather-wise but turned out to be a beautiful weekend. Thanks to all of you for stopping by. It was great to catch up with everyone! 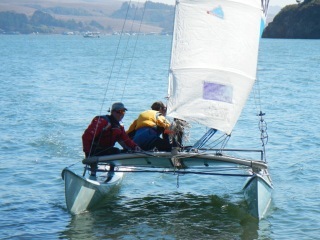 Sunday the 22nd join us for Earth Day at Dumphy Park in Sausalito to ready the park for the Hobie Beach for the 2012 North American Championships. We still have a few Hobie 16 boats available for purchase at a super deal if you're ready for a new one. Contact us if you would like to take advantage of the Hobie North American Championship Deal. Welcome to our new website. Come back here often to stay in touch with us.